This month we are all about script! It can be on the paper, using a stamp, in the sentiment-you chose! I used pattern paper with the script on it. It is either 7 Gypsies or Recollecions-I don't know. But the flower and leaves are Prima. And the clock center was given to me. Nice card Katy. Funny use of a clock face in the centre of the flower. How pretty - love the center of your flower - unique. Great card for this challenge. Gorgeous, rich color! Love this pretty design! Pretty script card. Good idea to put brown behind the sentiment to make it pop. Gorgeous card, love that flower! What a great take on the challenge, Jo x HOC/DT Friend. 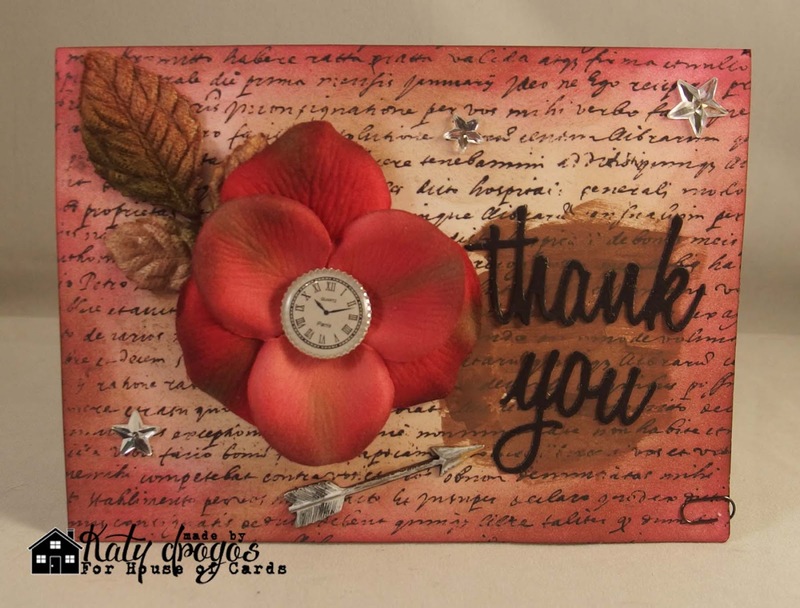 What a fabulous flower, the clock face really makes it something different, gorgeous card. Stunning card! I agree the clock face is a cool and whimsical touch! Wonderful card! Loving the clock as the center of the flower.